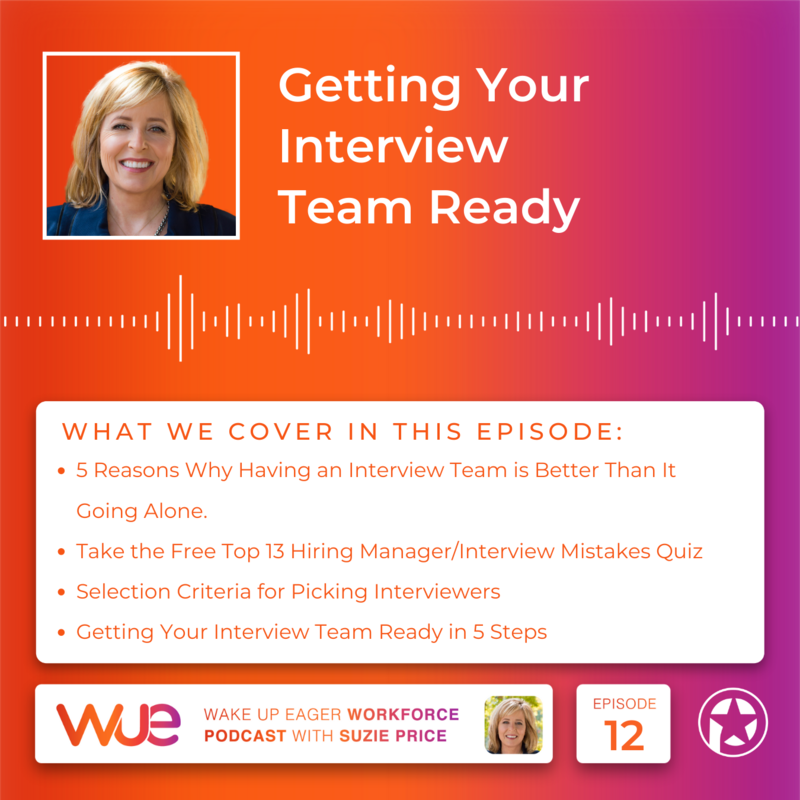 This episode will help you in your interviewing and hiring efforts so that you can be sure to put the right people in the right seats. Build more business success and outsmart your competition by doing the things, in the interview, that help you notice and attract the best employees. Audible offering to Wake Up Eager Workforce Podcast Listeners: Get an free audio download and a thirty-day trial, here. Over 150,000 titles are available. Two books that I recommend, that will help you in the employee selection arena are: Good to Great by Jim Collins and Topgrading by Dr. Bradford Smart. Go to: www.pricelessprofessional.com/audible to get either one for free. Having a unprepared interview team is like going to the grocery store in a rush... The new guy, who sounded great in the interview and the the entire interview team liked him, but turns out he's missing a important 'ingredients' and you end up making the best of what you had, but it's not what you intended, and it's not ideal. 1. Each interviewer on your interview team must have a vested interested in the success of the position. 2. Each interviewer on your interview team should have some training into how to interview. 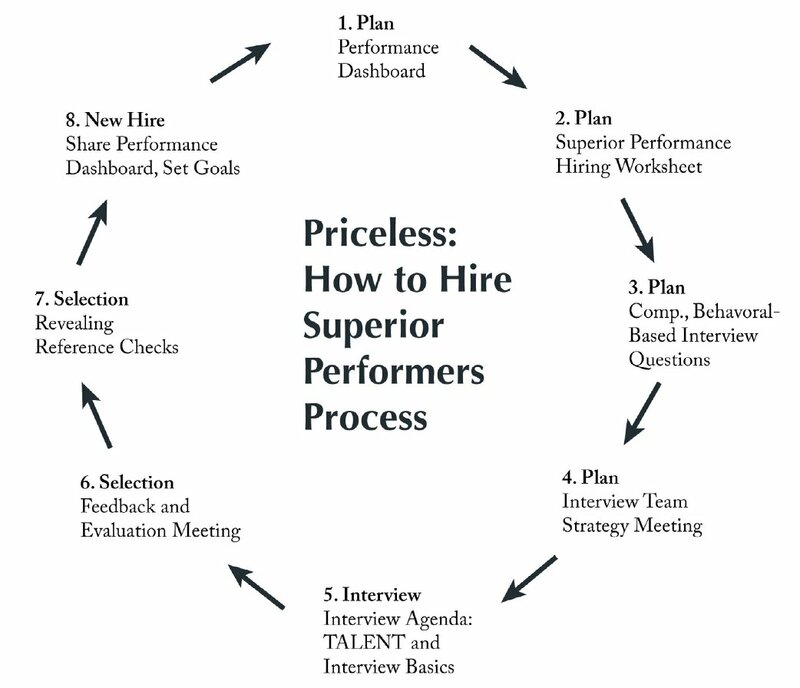 Here is an image of the Eight Step Superior Performance Hiring Process that I recommend. If the image is not showing in the show notes - here is a link to it online. Schedule this meeting 24 hours (or less) after candidate interviews; can be in person or by conference call; make this a mandatory meeting. Assign Interview Focus Areas Focus Area Worksheet: blank – form fill-in online PDF worksheet. Worksheet for focus areas, here. While you are focused on vetting the candidate and you’re looking for job fit by asking competency, behavioral-based interview questions, putting on your pleasant but response-neutral face and listening aggressively, you also need to remember that the interview is a mutual selection process. The best candidates usually have several options that they are considering. They are focused on selecting the best employer that meets their needs. Everything the company does during the interview process reflects on the company brand and the candidate’s perceptions as to whether your company is good place to work. Ask each interviewer to share, in the meeting in round-robin fashion with you and their peers, their answers to those two questions. Having each interviewer share their “why” statements in the READY meeting helps each interviewer practice what he or she will share. It will also help others who are not sure what to say to candidates share more clearly and be more effective. Closing the meeting with a round-robin exercise like this ends the meeting on a high note. It also helps everyone remember that while they are vetting. It’s important to have a strong and succinct “why” statement and to share it with your candidate as the last step in the TALENT interview agenda. Sharing a powerful and meaningful “why” statement will be one of the last impressions you leave with the candidate. Step 1. Brainstorm (an uncensored list) all the ideas and thoughts you have around why working at your company and in this role is so great. Step 2. Pick three to five key points from your brainstorm list that best explain why working at your company and in this position is desirable. • Remind the candidate of the great location, benefits, leadership, or team.